An Australian inventor with a futuristic creative streak is building a bike that he says can fly at high speed while hovering above the ground at low altitudes. Chris Malloy says the one-person hoverbike could replace conventional helicopters for tasks over rugged terrain such as aerial surveys, search-and-rescue missions, and cattle roundups. It purportedly weighs more than 240 pounds, has an untested airspeed of 172 mph and, in theory, could fly as high as 10,000 feet. It uses regular unleaded fuel and has a 7.9-gallon tank. Pricing has not been firmed up, and the vehicle has not yet reached production phase. Malloy is seeking additional funding or a sponsorship. Contributors have so far pledged $70,000 toward his $1.1 million goal. The proposed hoverbike would be operated by a pilot sitting between twin dual-blade propellers and using motorcycle-like controls. Parachutes would be attached to the frame in case of an emergency. 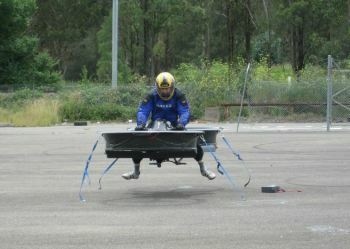 Malloy's hoverbike website has photos of the prototype, which is tethered to the ground during testing in case something goes wrong.